ZEPTO™ is a novel capsulotomy device with a disposable handpiece and tip that produces a quick, elegant, round capsulotomy in milliseconds. The tip consists of a miniature, transparent, soft silicone suction cup that houses a circular nitinol capsulotomy element, which has been refined at the micron scale to enable uniform 360-degree capsule cutting. Nitinol is a superelastic alloy, meaning the tip can be deformed in order to enter gently through a clear corneal incision, after which it assumes its original round shape within the anterior chamber. Complete, round capsulotomies are accomplished in a few milliseconds. THREE: After the desired capsulotomy placement, a small amount of suction is applied through the silicone suction cup to appose the nitinol capsulotomy ring to the lens capsule. FOUR: At the surgeon’s command, the capsulotomy is performed in milliseconds. Suction is relieved as the surgeon slides the sliding mechanism to the back position and ZEPTO is retrieved through a corneal incision. 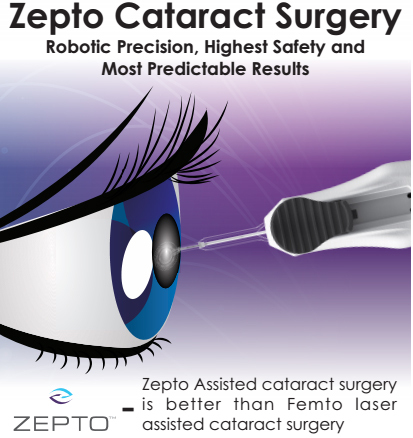 ZEPTO allows intraoperative capsulotomy centration on the patient’s visual axis for an optimized outcome. ZEPTO™ allows you to create precise, visually centered, and stronger capsulotomies in milliseconds.